I'm going through a minor crisis right now. Before you get worried, calm down. I'm just having a inner argument about showing gerbils. I showed (correct grammar?) Athena at the Maryland show this year and really enjoyed it. 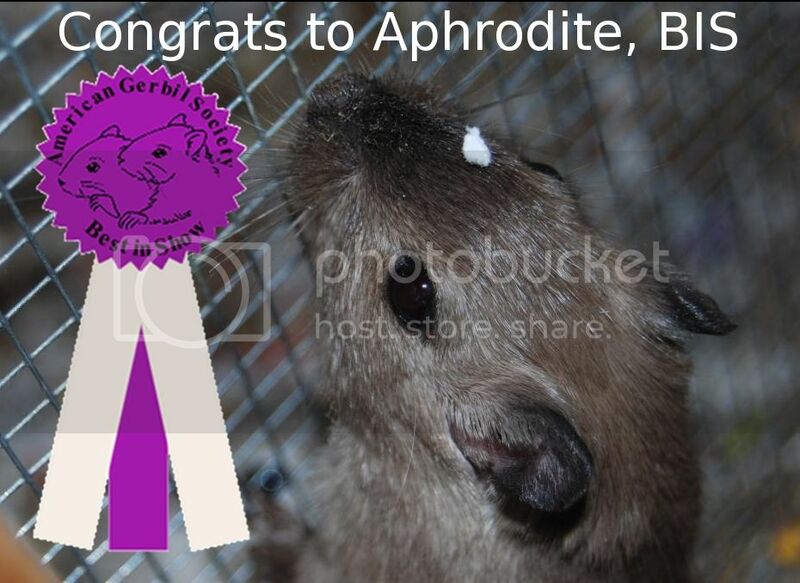 That was the same show where some of Katie's (Moonstonegerbils) gerbils caught a disease. That scared me off of showing, but now I wonder whether I should really be this worried. I mean, that's the only time I've heard of it, and I've talked to a few breeders about it. See, my problem is that I would love to show, but I don't want my gerbies to get sick. Yet at the same time I really enjoying showing. Then I feel selfish for even thinking about endangering my gerbils. But then I think wait-- but this is really uncommon! do I really have to worry about this? My thoughts are just going in circles and I really don't know what to to. I'd just like to know what other people think about showing. PS If this is in the wrong place, sorry!